People often ask the Rush University Medical Center Archives staff who was the “first” — the first female student of Rush Medical College, for example, or maybe the first African-American on the hospital staff. The answers are often more complicated than people would like. And sometimes they are impossible to answer definitively. 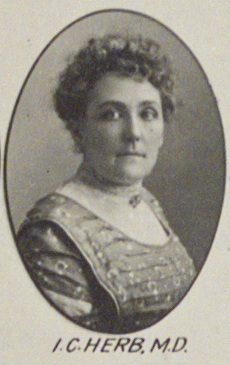 However, one first we’re sure of is the identity of the first woman on staff at Presbyterian Hospital in Chicago. Presbyterian Hospital, founded in 1883 on this campus, was an early predecessor of Rush University Medical Center. Herb’s research contributions to the fields of pathology and anesthesia are demonstrated in her publications. Her role as an advocate for the profession is also clearly apparent. 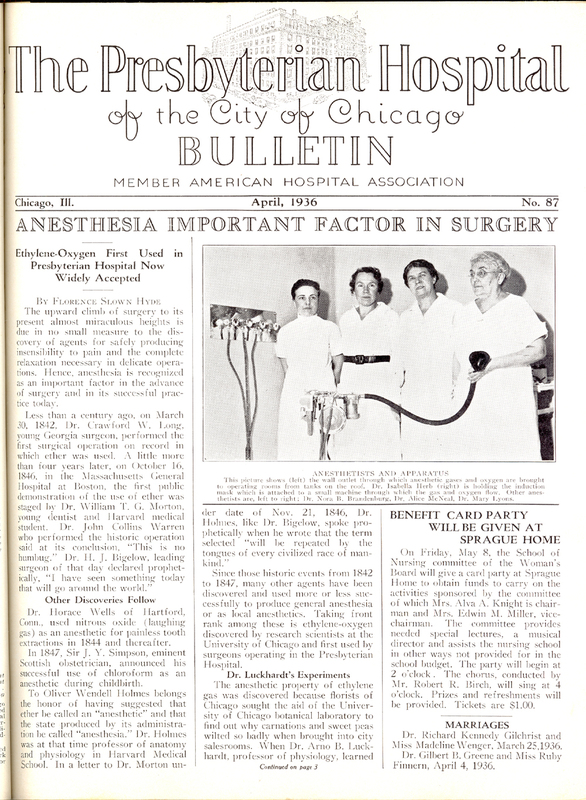 “Anesthesia is the one field in the practice of medicine in which there is a seemingly indifference and lack of compensation,” she wrote in “The Anesthetic Problem in its Relation to the Hospital.” Herb, pictured here in a 1936 issue of the Presbyterian Hospital Bulletin, retired in 1941 and died of heart disease in 1943. Sarah Scheinman is a Dominican University Library Science student who recently completed a semester-long practicum at the Rush University Medical Center Archives. Nathalie Wheaton is assistant archivist at the Rush University Medical Center Archives. Do you have a question about Rush’s history? Contact the Rush Archives at (312) 942-7214 or rush_archives@rush.edu or visit us at http://www.lib.rush.edu/archives. This entry was posted in Rush Archives, Rush University, Women in Medicine and tagged anesthesia, presbyterian hospital, rush medical college. Bookmark the permalink.